STOCKHOLM — Sweden early Saturday arrested a man for a "terrorist crime" hours after a beer truck ploughed into a crowd outside a busy department store in central Stockholm, killing four and injuring 15. The man was arrested "on suspicion of a terrorist crime through murder," Karin Rosander, a communications director at the Swedish Prosecution Authority, said. Police said earlier on Friday after the attack that they had detained the man who "matched the description" of a photo released of a suspect wearing a dark hoodie and military green jacket. But they did not confirm if he drove the truck. According to the Aftonbladet newspaper, the same man is a 39-year-old of Uzbek origin and a supporter of the Islamic State (IS) group. If confirmed as a terror attack, it would be Sweden’s first such deadly assault. The 15 injured included children and nine people were "seriously" wounded, health authorities said. Prime Minister Stefan Lofven said he had strengthened the country’s border controls. "Terrorists want us to be afraid, want us to change our behaviour, want us to not live our lives normally, but that is what we’re going to do. So terrorists can never defeat Sweden, never," he said. 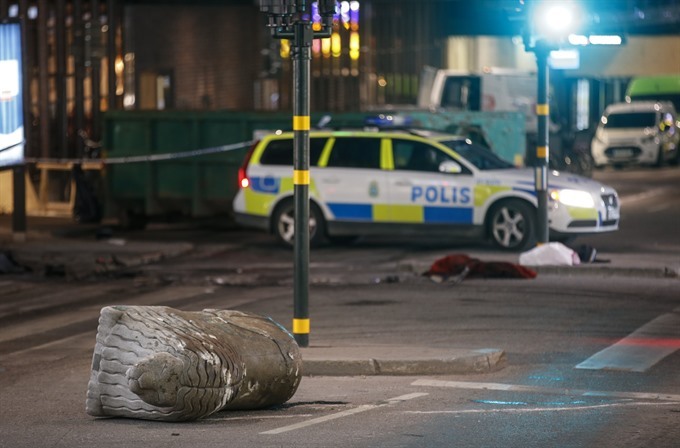 The attack occurred just before 3:00pm (1300 GMT) when the stolen truck slammed into the corner of the bustling Ahlens store and the popular pedestrian street Drottninggatan, above ground from Stockholm’s central subway station. Pictures taken at the scene showed a large blue beer truck with a mangled undercarriage smashed into the Ahlens department store. "A massive truck starts driving ... and mangles everything and just drives over exactly everything," eyewitness Rikard Gauffin said. "It was so terrible and there were bodies lying everywhere... it was really terrifying," he added. The truck was towed away in the early hours of Saturday. Police cars and ambulances rapidly flooded the scene after the attack, as central streets and squares were blocked off amid fears that another attack could be imminent. Helicopters hovered overhead across the city, sirens wailed, and police vans criss-crossed the streets using loudspeakers to urge people to head straight home and avoid crowded places. But with the metro system and commuter trains shut down for several hours after the attack, other streets heading out of the city were packed with thousands of pedestrians trying to find a way home. Haval, a 30-year-old sales clerk who didn’t want to reveal his last name, was in the metro at the time of the attack. His train stopped immediately and he had to get out, along with all the other passengers. They walked along the street before being ushered inside a nearby hotel for safety. "We were suddenly trapped inside a hotel and there was the worst kind of horror in there," he said. "We were scared, we were scared something else would happen, he added. In an editorial, Sweden’s biggest broadsheet Dagens Nyheter wrote: "What we feared for a long time finally happened." "The fear and panic right after the incident was inevitable. The images from the attack were terrible," the paper said. But Stockholm managed to stay "cool-headed" even though the attacker struck "Sweden and Stockholm’s heart", it added. Friday’s attack was the latest in a string of similar assaults with vehicles in Europe, including in London, Berlin and the southern French city of Nice. The deadliest came last year in France on the July 14 Bastille Day national holiday, when a man rammed a truck into a crowd in the Mediterranean resort of Nice, killing 86 people. Last month, Khalid Masood, a 52-year-old convert to Islam known to British security services, killed five people when he drove a car at high speed into pedestrians on London’s Westminster Bridge before launching a frenzied knife attack on a policeman guarding the parliament building. HÀ NỘI — Prime Minister Nguyễn Xuân Phúc on Saturday sent a message of condolences to his Swedish counterpart Stefan Lofven over a recent truck attack in downtown Stockholm capital. Also on Saturday, spokesperson of the Foreign Ministry Lê Thị Thu Hằng extend the country’s deep sympathies to the Swedish Government and people, especially families of the victims. Answering reporters’ questions on Việt Nam’s response to the attack, she said Việt Nam condemned the attack, stressing that “those behind the attack will be strictly punished”. According to the spokesperson, no information on any Vietnamese victims in the attack has been reported so far.